Every Saturday and Sunday during Open Farm Days we offer free workshops. Please see the “Classes & Events” page of this blog for the titles and schedule for these workshops (and please note that our workshop time slots are a bit different this year than in past years). We will have over 1,600 different varieties of plants for sale….all types of herbs, heritage & heirloom vegetables, strawberries, currants, grapes and raspberries and other small fruits, heirloom fruit trees, edible & old-fashioned flowers and fairy miniature garden plants. There will be lots of native and unique perennials, including wildlife-friendly habitat plants, beautiful hanging baskets, hardy and tender succulents & much much more!! We accept cash, good checks, credit and debit cards. 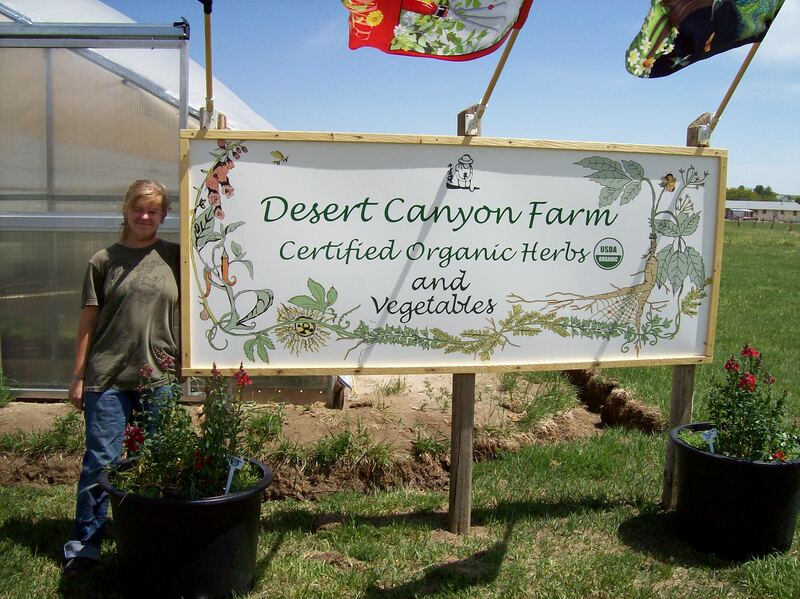 Our plants are USDA Certified Organic and are grown on-site at our farm!! An Earth Day Invitation Each Year! As you may know, Desert Canyon Farm is part of the Colorado Division of Wildlife’s Colorado Birding Trail. What this means is that we welcome people to the Farm to do some bird and wildlife watching. We have a tremendous community of wild birds that live and visit the Farm. So, to celebrate Earth Day each year, Chris and I would like to extend a special invitation to you to come to the Farm and do some bird-watching. Earth Day always happens during our Open Farm Days, when there are free workshops happening, along with the Farm Stand store to visit in case you want to shop for some plants, but even if these things are not of interest, Earth Day is a wonderful day to come and commune with nature and some of the wildlife that we share this Farm with. We have a huge diversity of wild birds here. On Earth Day and each Open Farm Day you are welcome to wonder the Farm and enjoy them. What you may want to bring; birding or field glasses, a bird id book, maybe a nature journal or sketch pad, your camera. We have some places to sit and watch the wildlife on the farm, but if you want a mobile chair, bring a folding camp or lawn chair. Dress for the weather and a water bottle if it is hot or a thermos of hot tea or hot chocolate if it is cold, would be nice too. We won’t be doing guided tours on Earth Day, but we have a map of the farm and you can explore the outside areas to see what birds and other wildlife (cottontail rabbits, rock squirrels, tree squirrels, deer) you can enjoy watching. This is a free invitation and we encourage you to accept it between the hours of 9:00am and 4:00pm every year on Earth Day and each day of our Open Farm Days every spring. As part of the Colorado Birding Trail, our farm is open to birders and wildlife watchers throughout the year, but some specifics apply. You can read all the details of how to visit the farm other times of the year beyond our Spring Open Farm Days by reading the “Wildlife & Birding Opportunities” page of this blog. You can visit for wildlife and bird watching other times of the year too but please let us know when you would like to visit at dcfhomeplace@gmail.com . Directions to the Desert Canyon Farm: Come into Canon City, Colorado on Hwy 50. Once in Canon City, turn north on Raynolds Avenue (note there is a stoplight at this intersection and a Burger King on the NW corner). Take Raynolds Ave. north until it curves west and intersects with Field Ave. Turn north on Field Ave. and continue for approximately 1 mile. You’ll see the Farm sign on the right side of the road, along with our greenhouses. The address is 1270 Field Ave. If you come to the saw mill, you have passed us by. Please leave your pets at home. This is a wildlife preserve and home to our dog, cats and ducks, so it is not comfortable for them when other pets visit. Thank you. Please note that we are a working farm and are not able to accommodate your visit except on the dates listed above. Remember that this is the only time of the year that the farm is open to the public, although birding and wildlife watching opportunities are possible by appointment (see that page for details), as are guided farm tours for groups, also by appointment. Please do not visit at other times. That said, if you would like to schedule a Farm Tour by appointment from June 15th thru October 31st, you can call 719-275-0651 during normal business hours (8am-5pm) Monday through Thursday. Thank you.